Viva Pinata: Trouble in Paradise is the Xbox 360 exclusive sequel to the widely popular Viva Pinata. With similar gameplay but additional biomes and co-operative play the title is everything you loved plus a little extra. 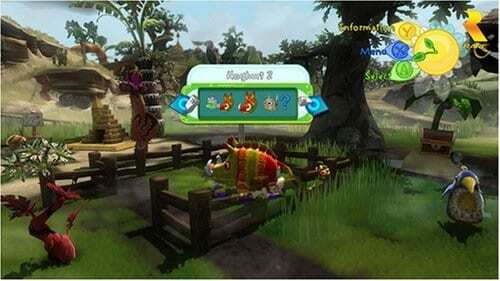 The game was eventually made available on Xbox One through the Rare Replay compilation. In Trouble in Paradise players will return to the magical island of the original game and once again be gardener to the unique pinatas that live there. Starting from scratch players are given free reign over the design of said garden with a story backdrop to guide some of your progress. The story will have you coming face to face with Professor Pester and his Ruffians gang who have wiped the computer system of Pinata Central and in turn stealing all the valued information contained therein to gain control over the entire island. In order to restore this information players are tasked with attracting every pinata possible to inhabit their custom garden. Gameplay wise those that enjoyed the original will find very similar mechanics in Trouble in Paradise. You’ve got a few tweaks here and there (mostly to the UI) that give the game a better flow but ultimately it’s the same gameplay you previously fell in love with. The garden size is also similar but the amount of items and item limit have been dramatically increased for more customisation options. All the original 60 varied pinatas are there but in addition you’ve for a further 28 to attract, feed and mate. The majority of these new pinatas are also quite exotic, ensuring they are harder to attract and thus providing returning players a nice challenge. These new additions are also weighted to the new biomes of Pinarctic and Dessert Desert. For fans of the original this is a must buy but it’s also equally attractive to newcomers. Sequel to the popular life simulation and pinata collecting title. 28 new pinatas and 2 new biomes. Enjoy online co-op with friends. Same great gameplay but a number of UI improvements. Originally for Xbox 360 and subsequently available for Xbox One.